Google has launched the first Chrome OS tablet, and it’s called the Acer Chromebook Tab 10. This 10-inch tablet is designed to beat Apple and the iPad into submission, and cement Chrome OS as the number one operating system in the education market Four Awesome Ways to Use a Chromebook in the Classroom Four Awesome Ways to Use a Chromebook in the Classroom Chromebooks now account for twenty percent of all United States school purchases of mobile computers. What role can Chromebooks play in the education sector? Read More . Despite the cynics, Google’s Chromebooks have grown in popularity. They’re popular with ordinary consumers who want an affordable, easy-to-use laptop, and they’re extremely popular in classrooms, where the next-generation of consumers are being forged. Chromebooks have, until now, been laptops. Some have sported touchscreens, and some have had 360-degree hinges so they can be used as tablets. But now, with the Acer Chromebook Tab 10, we have a Chrome OS tablet designed to compete with the iPad. The Acer Chromebook Tab 10 has a 9.7-inch IPS touchscreen, a Rockchip processor with a dual-core Cortex A72 and quad-core Cortex A53, 4GB of RAM, 32GB of eMMC storage, a 2MP front-facing camera, and a 5MP rear-facing camera. And it weighs in at 1.21 pounds. The keyboard sported by every other Chromebook has been replaced with a Wacom EMR stylus. This can be stored away in the Chromebook Tab 10, and doesn’t require a battery. It’s also provided free with the device, which is set to retail at US$329. The Acer Chromebook Tab 10 will be available in the U.S. in April, but it’s initially only being sold to education and commercial customers. It will arrive in Europe in May (priced at €329), and it has to be assumed will eventually be available to ordinary consumers. Who Needs an iPad Anyway? It’s no coincidence that the Acer Chromebook Tab 10 has been priced the same as the entry level iPad. 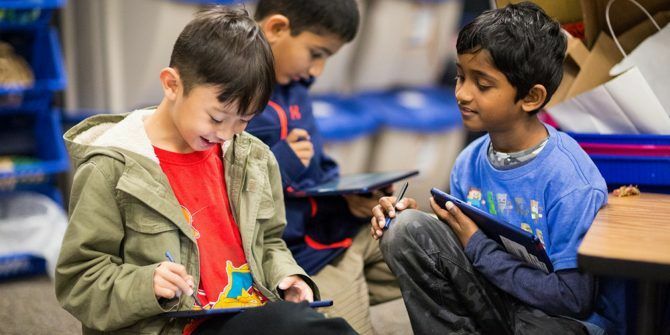 Google already dominates in the education market, and releasing a Chrome OS tablet with similar specs and price as Apple’s effort should bolster that victory. If you haven’t yet tried Chrome OS, we recommend you read our previous coverage on Chromebooks. Whether it’s the essential tips for new Chromebook users 20 Tips Every First-Time Chromebook User Should Know 20 Tips Every First-Time Chromebook User Should Know Chromebooks are great, but come with a learning curve, and take some getting used to if you've switched from macOS or Windows. Here are several Chromebook tips and tricks to speed up that process. Read More , the apps you need to replace your desktop favorites Switching to Chromebook: 8 Apps to Replace Your Desktop Favorites Switching to Chromebook: 8 Apps to Replace Your Desktop Favorites The hardest part about switching to a Chromebook is that you cannot install Windows or Mac software, but Chromebooks are perfect for everyday tasks. These top Chromebook apps can replace your desktop favorites. Read More , or our guide to picking the perfect Chromebook How to Pick and Buy the Perfect Chromebook How to Pick and Buy the Perfect Chromebook Allow us to help you pick the right Chromebook for your needs. Read More .